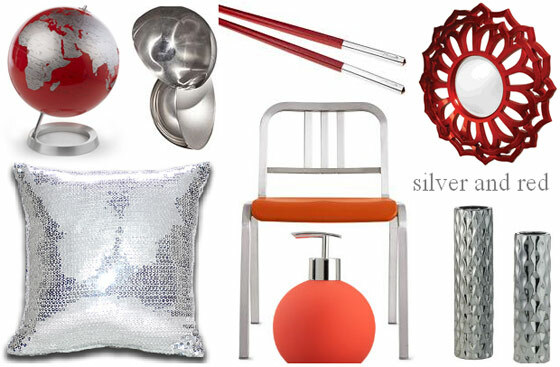 Silver is a very versatile color with a brilliant shine. It looks amazing up against any other color, though I must say, it is perfect paired with black. Another color that marries well with silver is red. There are several pieces that seemed interesting enough to round up, but it was a bit hard to find a decent amount of decor items that were of this color combination. Do you like red and silver together? www.colourlovers.comOlan provides design consultations and is a proud mother of three who effectively manages both family and business life. She graduated with a bachelor of fine arts degree in interior design and truly loves what she does, her remarkable work ethic and dedication are a clear indication of that. i'm a fan of silver with deep, dark red. i love that globe, really striking.